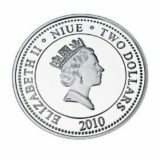 Issued on June 20, 2009. 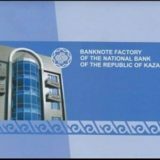 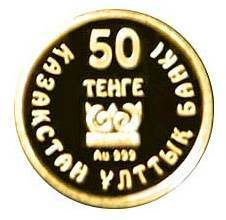 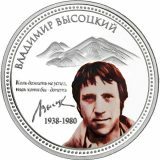 Averse: the image of ornamental pattern; the legend in Kazakh; the face value of the coin “50 TENGE”; “Au 999” means metal, standard of the coin. 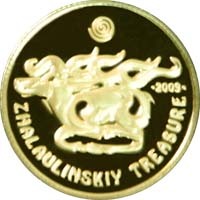 Reverse: the image of gold deer from Zhalaulinkiy Treasure; “2009” means the year of coinage; the heraldic representation of a spiral; the inscription “ZHALAULINSKIY TREASURE”. 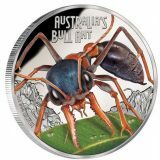 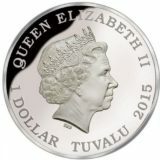 The coin is made from 999 standard gold, the weight is 0,5 gr, production quality is “proof”.